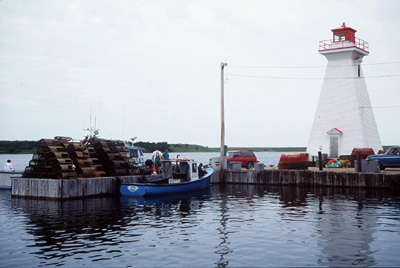 The pyramidal wooden lighthouse at Mabou Harbour was built in 1884 to guide coastal steamers transporting non-perishable goods into the only protected harbour on the western side of Cape Breton Island. At that time, a number of general stores served the countryside for miles around. At various times gypsum was shipped from here, and there was a lobster and salmon canning factory right next to the lighthouse. Now, the pretty lighthouse is the Mabou Harbour Museum and Tourist Centre, opened in June 1998, to showcase the history of the lighthouse and the village. Tower Height: 047ft feet high. Light Height: 044ft feet above water level.